Antique Russian Karabagh Square Rug 02’08” x 03’11” From Esmaili Rugs Collection. 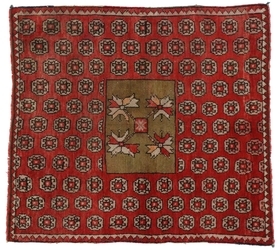 This antique Russian Karabagh rug features a striking allover geometric pattern enclosing a square medallion. Rendered in contrasting colors of red and camel brown with beige brings warmth and energy to a space. A triangle shaped border frames this dramatic red rug. Prized for its unique square shape, tribal aesthetic and rectilinear qualities, this antique rug is well-suited for modern environments.